Imagine how your business would look when clients trust you wholeheartedly to recommend and provide the latest in beauty. When you first got the idea to launch your career in the beauty service industry, you probably had a lot of questions. Or if you’ve already started, you probably are constantly thinking about how to get more clients, keep them coming back, and how to enhance the good stuff you’ve already got going. Foxy Face was created to help people just like you find the answers to your questions, gain the skills you need to stay ahead of the curve, and truly learn how to use your skill and knowledge to boost your career and your business! We address all of those things, because, like I mentioned earlier, at Foxy Face helping people is a passion, and we are determined to give you the skills and knowledge you actually need in order to launch or enhance your beauty career. As the forerunner in training, we are setting the standard! As LashForever Canada’s ONLY authorized trainer in Ontario, CA, we offer training you can trust! No doubting whether or not the techniques and information you’re learning is up-to-date because LashForever Canada only offers first-class material. Foxy Face takes LashForever’s premium training and ENHANCES it with personal attention (no large classes- ever! ), so you can ask all the questions and get all the feedback you need! …AND we offer some of the only beauty service certifications that insurance companies actually accept…because we know that without proper insurance, you’re putting your business at risk! 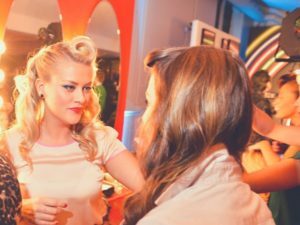 At Foxy Face we provide the latest in the beauty industry, specializing in a variety of lash enhancements, makeup services and the latest HDi Embroidery Brow (also known as the popular microblading technique). Your experience with us is held at the highest of standards. We believe in making people look and feel their best. Pair that with unequivocal professionalism, skill and quality, and you’ll see why we insist on providing experiences you will love and remember! Our goal is to help you look and feel beautiful, enhancing your natural beauty and providing the tools to make it happen. Hello! I’m Mary Kleinpaste, the owner and head trainer of Foxy Face. After 15 years in the beauty industry, I still love to help people look and feel amazing and I believe with the right tools you can be the best version of yourself. Whether through helping my clients, or conducting premium training, following my passion has provided me with knowledge and the ability to do what I love and to make a difference in the lives –and businesses– of women just like you. Most of all, thanks to the success of Foxy Face, I am so happy to share my experiences with you! Unfortunately, people are often disappointed with their training, or their beauty experience, and I’m out to change that! Anyone who has the desire to start their own business, or enhance it should be able to, trusting that their investment in training will ABSOLUTELY payoff. There’s nothing worse than finding out that you’ve wasted your money. If you took a training and afterwards were left hanging to “figure things out,” or if you ever wondered about how to find new clients, how to consult with them effectively, how to offer the services they need- when and how they need it, and how to keep them coming back…then you NEED to take a look at our training programs. This innovative enhancement is growing fast within the beauty service industry and now is the time to get ahead of the crowd and learn this advanced technique from the top school in the industry. We guarantee unparalleled success with our Classic Lash Collection and our 3 day training course which includes extensive theory testing and hands on demonstrations with live models. Introducing Lashforever Canada’s revolutionary lashing technique! You will learn how to apply up to 4 super-fine, single extensions to each individual eyelash, creating a look that is full of volume and safe for your client’s natural lashes. The ultimate alternative to eyelash extensions. Semi-Permanent Mascara can also be applied to our Mink Lash Extensions to give your client a more dramatic look. Incorporating our Lash Lift with our Semi-Permanent Mascara adds even more volume and curl. It can also be done on it’s own, with regular tinting, Lashforever Canada mascara and our lash extensions. Lasts up to 3 months. Getting Good Vibes? Join Us! Finally, if you believe in our philosophy and want to stay in touch and receive the latest of what’s going on at FoxyFace and in the industry, join us! Just add your name and email below! Deposits, Final Payments, Refunds & Exchanges: Please note deposits and final payments are non-refundable and a $150 transfer fee will apply as well as the full course price to be paid in full in order to transfer course dates. There are no exchanges or refunds for products provided in class or in the kits received in class. Any additional products purchased after training can be returned within 14 days and must be in original state. A 25% restocking fee will be charged if items are returned with no reasoning.